Unless you are from Southern California or one of the premier surf spots around the globe that deliver year round waves, or have millions of dollars to drop on a Wave Garden — you are left with traveling to find some decent and uncrowded waves. And if you want warm water, private boats, and mostly consistent waves — perhaps it’s time to check out the Maldives. Our Blue Shark safari boat is one of our most popular boats that we use to take surfers on private and shared charters throughout the Maldivian atolls. It has the ideal size, offers plenty of space on board with its several decks, is well equipped and maintained, and the professional and friendly crew is always there for you. Read more about the boat by clicking here or keep reading below. 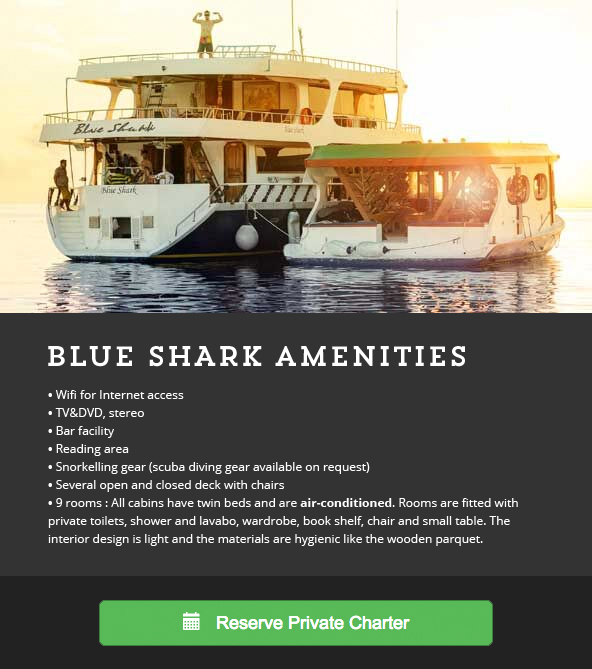 The Blue Shark was recently refurbished and tricked out with numerous amenities and features. The boat boasts a large sun deck that’s perfect for scoping out killer surf breaks as well as for just enjoying the stunning scenery, from the beautiful islands to the exotic reefs and marine life. The boat measures 29 meters long and 8 meters wide. We only allow 9 to 12 surfers on board our safari boat at a time to ensure that you get the absolute most out of your surfing sessions while also allowing you to maintain your privacy on board. The boat has nine air-conditioned cabins, all of which contain twin beds, private toilets, showers and more. Additionally, we’ve outfitted the boat with a bar, a reading area, Wi-Fi, a stereo and a TV and DVD player. A traditional Maldivian dhoni is towed along with Blue Shark allowing for room to store your surf equipment, and can even be used to split the group in two if the surfers want to surf different breaks. It wouldn’t be much of a safari boat if our boat didn’t have a few guides onboard – our guides are expert surfers and know the Maldives area inside and out. This means that you don’t have to worry about standing outside on our sun deck for the entire trip in fear of missing out on a great wave – our guides will keep a look out for you and inform you of what appear to be good surf spots. Aside from the guides, Professional photographer Thomas Beck will be on board, which means that you’ll have high-quality photos of you riding waves up to eight feet high. If you are a group of 10 people or more, you can book a private charter at any time. However if you are a solo surfer, you can always join an existing trip to the remote atolls with our Solo Adventure packages. You will be given the opportunity to explore and surf the Central and Southern atolls, not just the Northern atolls. There are currently 6 shared charters scheduled between April 3rd and June 26th in 2016 – book now to ensure your spot! Blue Shark begins its journey with two scheduled trips for April in the Northern Atolls. The North Male Atoll hosts the most popular spots and has waves for all skill levels. Starting in May, the boat will head south to escape the northern crowds with a scheduled trip in the Central Atolls. Only accessible by surf charters, there will be an abundance of speedy barrels for the intermediate surfer. 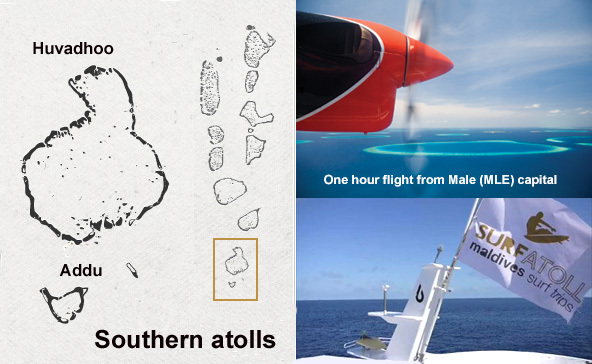 Following this trip are the remaining three scheduled trips in the Southern Atolls. With waves that break fast and throw hard, these trips will best suit the more advanced surfer. Surfatoll provides airport pick-up for all of our guests along with three meals a day and unlimited non-alcoholic beverages as well as use of all onboard equipment and facilities. Each trip is 13 nights in length, at cost of $210 a person per night. For the Central Atoll trip (Male to Laamu), your excursion starts at the Male International Airport (MLE). Surfatoll will pick you up from the airport and bring you to the boat. At the end of this trip, passengers will fly back from Laamu airport (KDO) and will be back around 7 PM in Male. For the other trips planned in the Southern Atolls, passengers will fly from Male around 10:30 AM in the morning to Huvadhoo (KDM). Passengers can easily find a room for a night in Male if your flight times don’t meet the 10:30 AM domestic flight or you just want to explore the town. Book your trip now – you don’t want to miss out on remote-island BBQs, traveling by charter boat, or surfing the best breaks the Maldives has to offer. Be sure to visit Surfatoll for more information about our Blue Shark charter tips and check out our surfing photos from past trips. Maldivian surfer “Iboo” measures himself against global competition and rips it up! Subscribe to our newsletter Get the latest info, upcoming trips and special promotions or giveaways. Win a free trip to paradise! © 2016 SurfAtoll. All rights reserved.